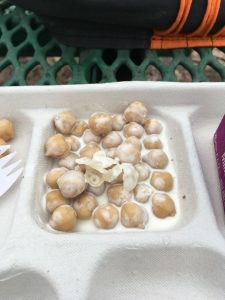 Hello and welcome back to School Lunch Confidential. Again this year I realize it is hard to make time to eat school lunch! I remember this problem from last year, where I didn’t manage to even eat school lunch once before December when I had some vacation. 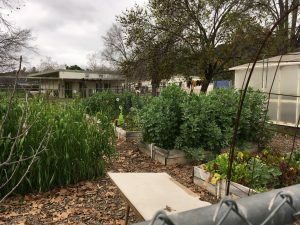 After the blur of the PTSD-inducing presidential election, the holidays, and some well appreciated rain, I was finally able to slip away for a quiet lunch on a cloudy Wednesday in early February at my local OUSD campus, Topa Topa Elementary. 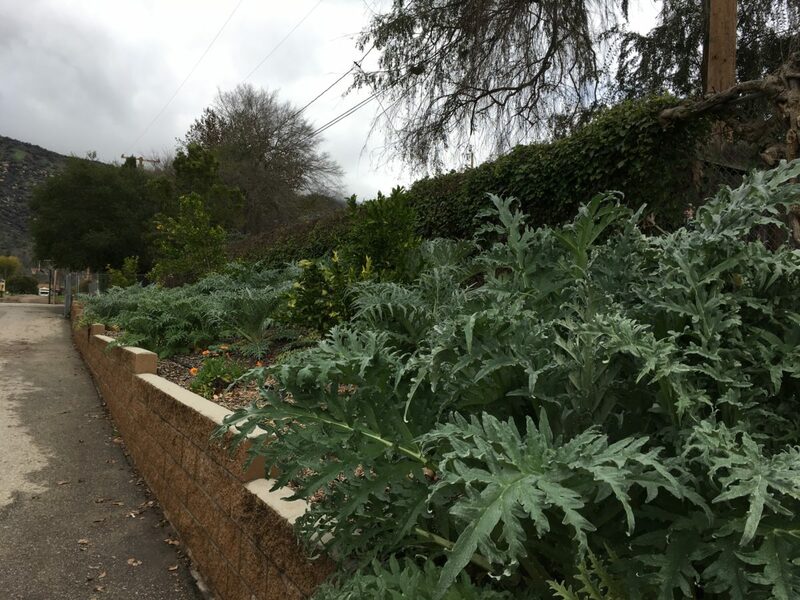 It was a joy to see all the plants in the school gardens flourishing with the welcome moisture! 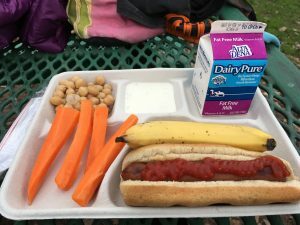 I was hoping to get the spaghetti with homemade sauce rather than the chicken tenders that were on the calendar for that day, but when I arrived, apparently neither was available and I got a hot dog instead. Hopefully this bait and switch thing can be worked out for next year so that lunch connoisseurs such as myself (as well as the students, I guess) aren’t so often disappointed. 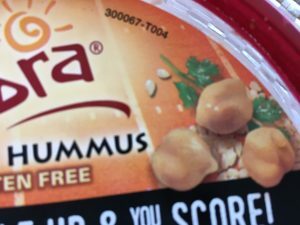 My main complaint this time was about the chickpeas. 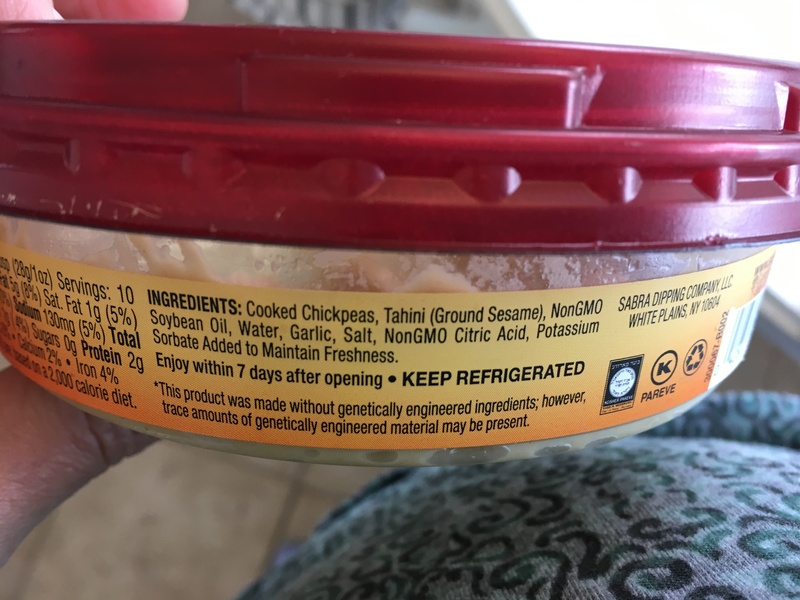 I am very diligent about eating all my food and even I was having trouble stomaching plain chickpeas that appeared to be straight out of the can. I had originally filled the well in my lovely compostable tray with ranch dressing with the intention of dipping the carrots in it. I had some of that left over and attempted a sort of slurry with the chickpeas that was a slight improvement, but I still could not finish them. Back home after my meal I was ruminating about the chickpea thing. It seemed to me that there was an easy solution to this problem that was hovering just out of my grasp… What is a tasty way to serve chickpeas that actually works well with carrot wedges? 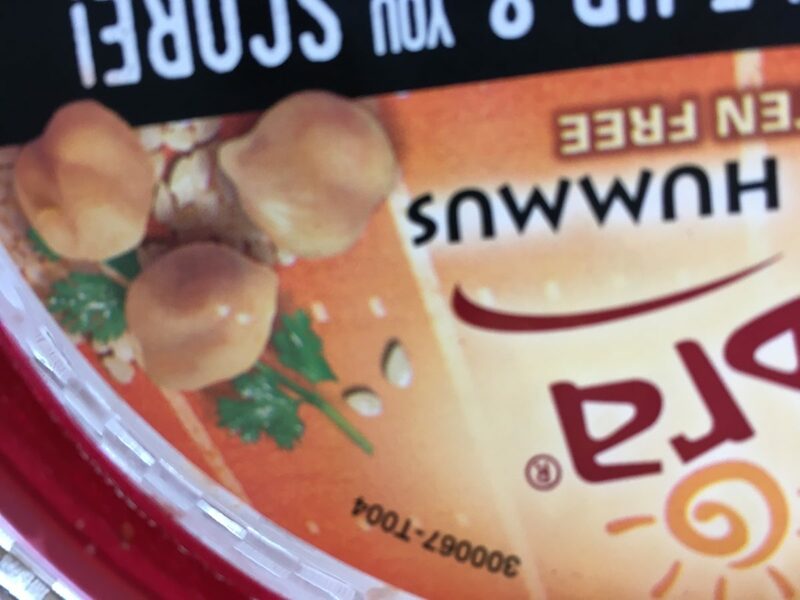 Of course: it’s hummus! In fact, I have been served exactly that healthful combo at various high-end foodie-oriented Food for Thought events over the years. Surely this is something that OUSD Nutrition services can handle: chickpeas, tahini, oil, water, garlic, salt. I believe one just mushes it all up together. Just a thought. 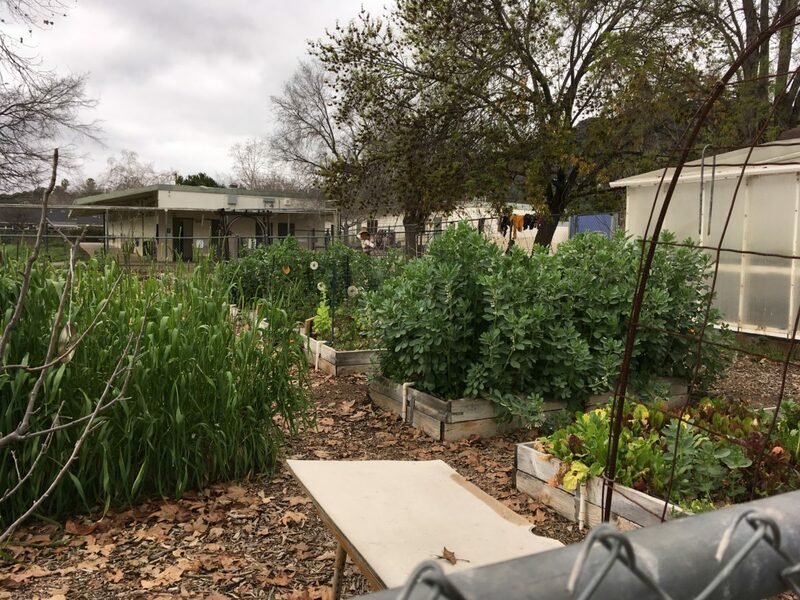 I hear through the Food for Thought grapevine that OUSD will be modernizing and upgrading the school kitchens over the summer. I look forward to enjoying more innovative homemade recipes as the nutrition services staff is empowered to do their stuff. And if I am ever served hummus for lunch I will certainly be taking all the credit for that.